Feeling inspired to make a change in your life? 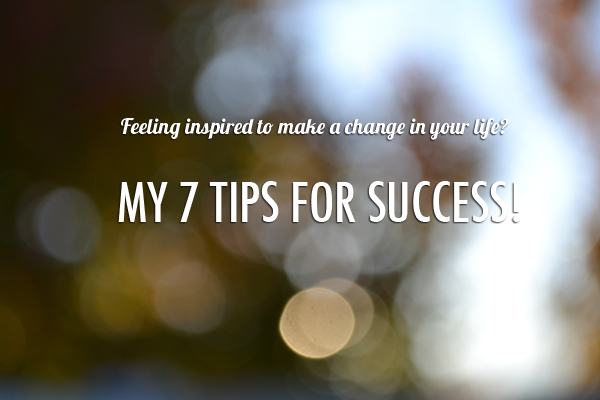 My 7 tips for success! After I wrote How to harness your body to do and become what you want” I thought to myself, “What would I say to someone if they really wanted to make a change in their life and wanted direction?” I started thinking about my own personal journey of overcoming obstacles and the lessons I have learned along the way. This a list of tips I’m still learning and practicing every day. I believe that it doesn’t matter what you are trying to change or achieve in your life, the unlying principles should continue to hold true. 1. Inspiration and insight will mean nothing tomorrow if you don’t apply something today. Whatever it is you are after, let it be more than just a nice external thought, let it be part of you by deciding to do something today. The sooner and more you practice something you have learned, the sooner and more it will become an inherent part of you. 2. Don’t worry about results, focus on creating habits, discipline and momentum, the results will take care of themselves. In a result driven society it is so easy to get caught up with end results. The problem with it is that if we don’t see quick results we are more likely to give up because we feel our efforts aren’t ‘working’. Whatever it is you are trying to accomplish, it is mostly likely built on creating positive habits and mental attitudes that will get your there. Start with small and manageable changes, improvements, habits that you can build on. As you continue you will create the momentum to keep going and improving. The hardest part is usually just getting started. You will get your results, it is just a matter of time. 3. Discouragement is your biggest enemy, don’t let it win. First of all, it is ok to get discouraged, it is normal to feel that way after a setback but what counts is what you decide to do after you ‘fall’. Decide now that you will not let discouragement have the final say. Decide now that in moments of darkness, confusion and utter discouragement, you will keep going, even when you don’t feel like it. Those dark feelings will leave because you have chosen not to focus on them and are focusing on something greater. Your body and human nature will want to do what it has always done. It wants to be in charge and will fight you to keeps its control over you! If you are trying to make a positive change in your life the battle WILL get harder before it gets easier, better or more pleasant. Know this. Know it is normal but remember that you are ultimately in charge of making the choices that will lead you to where you want to be. 5. Every setbacks/failures/weakness can be a gain! Roadblocks can really be our steps to higher ground! Setbacks can be our greatest teachers if we are humble enough to accept and learn from the lessons they are trying to teach us. I have personally come to find that my greatest struggles have become my greatest strengthens. I have met people who’s greatest trials in life have become their greatest blessing because they chose to learn and grow from them. 6. Your worth has nothing to do with your performance. Contrary to what the world has taught us all our lives, your worth has nothing to do with your performance. The world will try very hard to cram us into their skewed ‘worth-o-meter’ to gauge our supposed ‘value’ with some size, number, level or status. Your actually, true WORTH is infinite, (read my post about ‘feeling enough’) Once you realize this, your performance will most likely improve! Building self esteem by accomplishing is good but finding deeper and true sources of worth is even better! Our feeling of self worth doesn’t need to be tied to our level of performance or how we compare to other’s performance. Separating our performance from our self-worth helps us be less scared to try because we are less scared to fail because failures don’t really define us and because failures aren’t really failures until we stop trying. Discovering and feeling your true and never-ending worth provides deep rooted security and resilience in times of setback and humility and gratitude in times of success that keeps you centered and going. It is motivation from the inside out. 7. Give power to the divinity that lives inside you. True success actually starts within and then is just projected externally. The good news is that divinity already lies within you. You were born to win, succeed, and enjoy an abundance of peace love and happiness in this world. The key is to find peace, love and happiness within you first instead of trying to find that under every rock or person, place or thing. Having worthy goals is great but we can enjoy happiness with every step of the way instead of depending our entire happiness on the achievement of our goals. Keeping a balanced and centered life will give you the happiness you desire, make that a focus, and that alone will propel you to achieve whatever else your heart desires..
← How to harness your body to do and become what you want!